Sat., March 17, 2018, 6:46 p.m.
AUSTIN, Texas – Another defensive gem and dominant rebounding have Arizona State rolling into the second round of the women’s NCAA Tournament. Robbi Ryan scored 16 points and Kianna Ibis added 14 to lead the No. 7 Sun Devils over No. 10 Nebraska 73-62 in the first round Saturday in the Kansas City Region. Arizona State opened up a tight, defensive struggle with a 14-0 run in the third quarter. Jamie Ruden scored five during the stretch and the Sun Devils pushed the lead as high as 16 early in the fourth quarter when Reili Richardson converted a 3-point play. The Sun Devils (22-12) led the Pac 12 in scoring defense and made the Cornhuskers struggle for every basket, allowing them few second-chance points. Arizona State dominated the rebounding 49-27. The Cornhuskers went scoreless for nearly five minutes in the third quarter. Nebraska’s last chance came on a 3-pointer by Jasmine Cincore that cut the lead to 68-59 with 2:03 left. But 30 seconds later, Cincore was called for an unsportsmanlike play on a charge when she ran into with Ryan’s chin. Ruden and Courtney Ekmark then made two throws to get the lead back to 11 with 1 minute left and the Sun Devils put it away from there. Arizona State moves on to the second round for the fifth straight season, with a chance to make the Sweet 16 for the second time in four years. “I’m excited we get to keep playing, I always tell them the first game is the hardest because that’s when you’re nervous,” Sun Devils coach Charli Turner Thorne said. Nebraska: The Cornhuskers’ loss ends what had been one of the biggest surprise seasons in the country. Nebraska won just seven games in 2016-17 but turned things around to be a Big Ten title contender late in this season. Coach Amy Williams had said before the game she worried her team couldn’t match the Sun Devils on the boards, and she was right. Arizona State was more physical under the basket and quicker to the ball on the long rebounds. Arizona State: The Sun Devils turned in other defensive gem, smothering the Cornhuskers’ ball handlers on the perimeter and disrupting shooters. 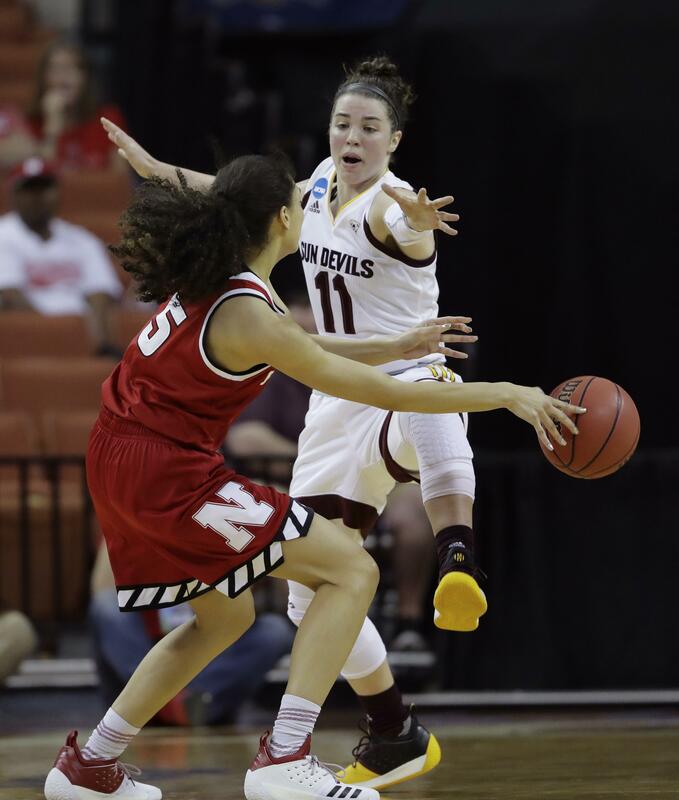 The Sun Devils held Cornhuskers guard Maddie Simon, who came in averaging 10 points, to no points Saturday. She took just one shot in 15 minutes. While some coaches shorten their rotation in the crunch time of the postseason, both teams when deep into their bench. Nebraska played 12 and Arizona State played nine. The Sun Devils had four players score in double figures. Nebraska had just six assists on 19 baskets as the Sun Devils made the game a 40-minute struggle for the Cornhuskers guards. Arizona State plays No. 2 Texas in Monday’s second round. Published: March 17, 2018, 6:46 p.m.